In the wake of the November 1938 Kristallnacht pogrom, Secretary of the Interior Harold L. Ickes began promoting a plan to use Alaska as a haven for Jewish refugees. Rich in natural resources but badly underpopulated, the vast northern territory had been purchased by the U.S. from Czarist Russia for $7.2-million. In the 1930s, Japan’s aggression against China and the likelihood of war in Europe intensified American concerns about Alaska’s strategic value, as well as its vulnerability. 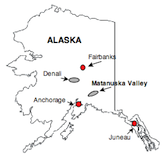 The Interior Department proceeded to prepare a full report, explaining the vast economic potential of Alaska, the military risks of leaving the area unpopulated, and the logic of bringing in “hundreds of thousands of pioneers” from other countries; the regular immigration quotas would not apply, since Alaska was not yet a state. Based on the report, Senator King and Rep. Franck Havenner (D-Calif.) introduced legislation to allow refugees to settle in Alaska. Meanwhile, refugee advocates created a National Committee for Alaskan Development, which built an ecumenical coalition of VIPs to back the legislation. Endorsers included Academy Award winning actors Luise Rainer and Paul Muni, theologian Paul Tillich, the American Friends Service Committee (Quakers) and the Federal Council of Churches. American Jewish leaders were reluctant to support the plan. American Jewish Congress head Rabbi Stephen Wise warned that the Alaska plan “makes a wrong and hurtful impression…that Jews are taking over some part of the country for settlement.” He argued that “just because small numbers of Jews might settle there” was not sufficient reason to support it. The Labor Zionists of America (Poale Zion) was the only Jewish organization to publicly endorse the King-Havenner bill. Other Zionist groups were concerned that opening Alaska to refugees would divert resources from the development of Palestine. Nativist and patriotic groups rallied against the legislation, claiming King-Havenner would open America to “Trojan horses,” such as Jews who believed in “the Marxian philosophy.” The most important opposition came from the State Department, which regarded the bill as an attempt to sneak aliens into the U.S. through the back door. At a private meeting, President Franklin Roosevelt told Ickes he supported allowing only 10,000 settlers per year for five years, and of that number “not more than ten percent would be Jews [so] we would be able to avoid the undoubted criticism that we would be subjected to if there were an undue proportion of Jews.” In the end, Roosevelt was not willing to call for even that many immigrants; he refrained from saying anything publicly about the Alaska issue. Without the backing of the White House, the Alaska plan never got off the ground. Feingold, The Politics of Rescue, pp.94-97.